Contributing columnist Terence Smith remembers those killed in Thursday's shooting at the Maryland newsroom. A contributing columnist for the Capital Gazette says staff sent a "clear and eloquent message" by putting out a paper Friday, the day after a "targeted attack" left five of its employees dead. "It's the way to prove that, contrary to what Donald Trump may say, they are not the enemy of the people. They are part of the community they live in, and they are not going to give up in the face of criticism, or in this case yesterday — violence," said Terence Smith, who did not contribute to Friday's edition. 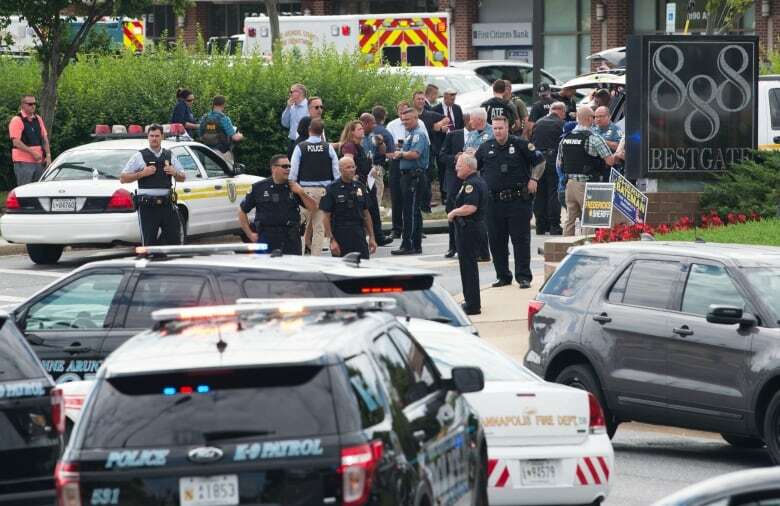 Four journalists and a sales assistant were killed when gunman opened fire at the newsroom in Annapolis, Md., on Thursday. Two others were injured. In the aftermath of the shooting, some of the paper's reporters worked in a parking garage. 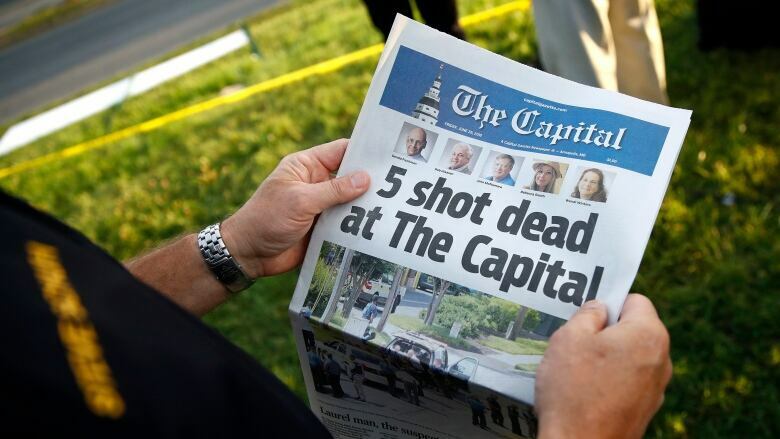 On Friday, the Capital Gazette published its paper with pictures of the five victims on the front page. Jarrod W. Ramos has been charged with five counts of first-degree murder and was denied bail. Authorities and court records show the suspect had a well-documented history of criticizing the paper's journalists. What conversations have you had with your colleagues in the past 24 hours? When I got news of the word the way we all discovered it, on our phone, I immediately called the editor … who was, as luck would have it, attending a conference three hours away from the office. He was driving frantically back to the office to try to help and guide his staff, and calling the families of the fatalities along the way. You can imagine what kind of trip that was. I understand you knew two of the five victims quite well. Would you share a story about them to help our listeners understand who they were? Gerald Fischman … editor of the editorial page — witty, ironic, lovely writer. He took on the most difficult, sensitive issues. He gave the Capital an articulate voice. He was also a pleasure to work with because I handled every column I wrote through him. The second person I knew well was Rob Hiaasen, associate editor and columnist himself. He chose to write about not the policy issues and the politics, but sort of the human foibles. He had a great touch. He was the younger brother of the novelist Carl Hiaasen. Police said that the man they had in custody barricaded the exit doors … and that he had planned to kill as many people as possible. What goes through your mind when you hear that? First, he knew the premises. He had a target. He went right down the row of the editors' offices. Secondly, he was a mad man. What can you say about the logic of a mad man? He was taking out his vengeance and his anger in the worst possible way. The president has said that his thoughts and prayers are with the victims and their families, and that journalists should be "free from the fear of being violently attacked while doing their job." But as you have already said, he has also referred to the mainstream media as "enemy of the people." Is there anything that you would like to say to the president, or anything you would like to hear him say? I thought his statement was perfectly polite, and civil, and to the point. I appreciated that it included no harsh language about fake news or anything of the kind. But is there any part of you that thinks that that atmosphere right now in America, around the attitudes towards fake news and journalists, that that might have contributed to this situation at all? On one level, you might think so. You might think it put it in the shooter's mind. On another level, if he has been arguing vengefully with the paper … in court and out of it … that sounds to me like something that is more personal than political. This Q&A has been edited for length and clarity. Written by Katie Geleff, with files from The Associated Press. Segment produced by Imogen Birchard.